So this post is going to be about my experience in the Quebrantahuesos on June 22, 2013. It was my first QH and I was excited, nervous but highly motivated too. I had already grabbed the documentation for the race on Friday and my bike was already set up and ready for the march. Saturday, started really early at 550. We had breakfast at around 615 and we were at the starting line at around 700. At 730 the race starts, but since we were at the end of the line we didnt really started rolling until 750 or so. Here is a photo of the line before the start. We start riding through Sabiñanigo streets and headed to Jaca through the highway(One whole highway for 10000 cyclist). We rode really fast during this part of the race, it was mainly flat. We could easily reach 35 kms/hr during that time. Once we reach Jaca we start getting ready to start climbing Somport. To tell you the truth Somport was no big deal, its a little long, but not really hard. Probably the worst moment was going through Base militar de Candanchú. When you reach the top of Somport you can grab some food, water or Gatorade. Picture from french side of Somport. This was all down hill. After Somport you are all the way into France. You start going down, and easily reach 70 kms/hr. I had to use the brakes a couple of times, since I didnt knew the road. After around 25 minutes you reach a flat terrain and you can realx and enjoy the view. Calm down and enjoy the view, cause Marie Blanque is getting closer and you are not going to have a good time on it. 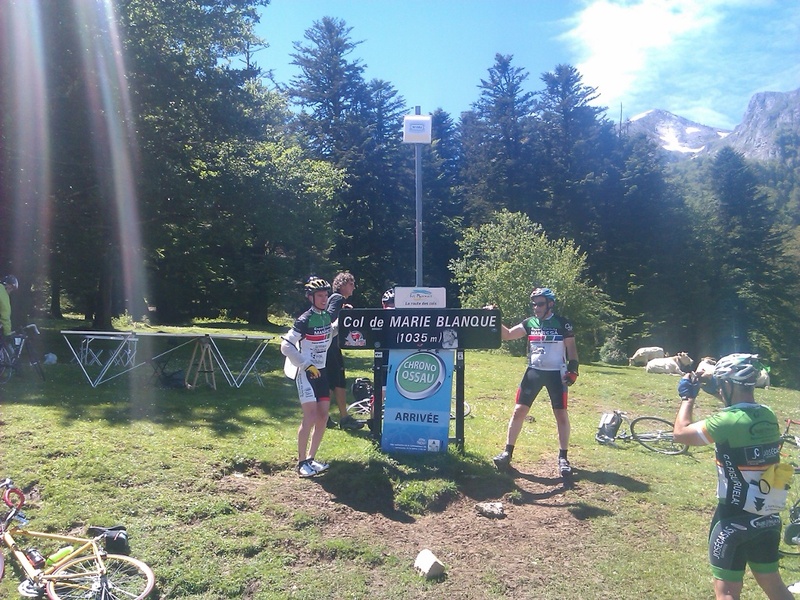 So after a turn right you start ascending Marie Blanque. First six kms. are a piece of cake, not too hard, no need to push it. Party starts after km. 6. After grabbing some water the party begins, you already see the rise in the gradient. Next 4 kms are going to come down from 10% and its almost a straigh line. So I breathe deeply and change to my 39×29 and up I go. First couple of kms. I was doing fine but around 1.5 kms. from the top I had to stop and and put both feet on the ground to grab some air. After around five minutes somebody helped me climb again on my bike and there I went again. My legs start hurting again and every meter feels like hell, heart rate starts increasing again and 500 mts. from the top I had to stop and drop both feet to the ground again and grab some air again. Theres people cheering all along the way and one says: “Come on! You are pretty close to the top”. So I think “What the hell!! !” and somebody else helps climb and top of my bike and reach the top after around 500 mts. 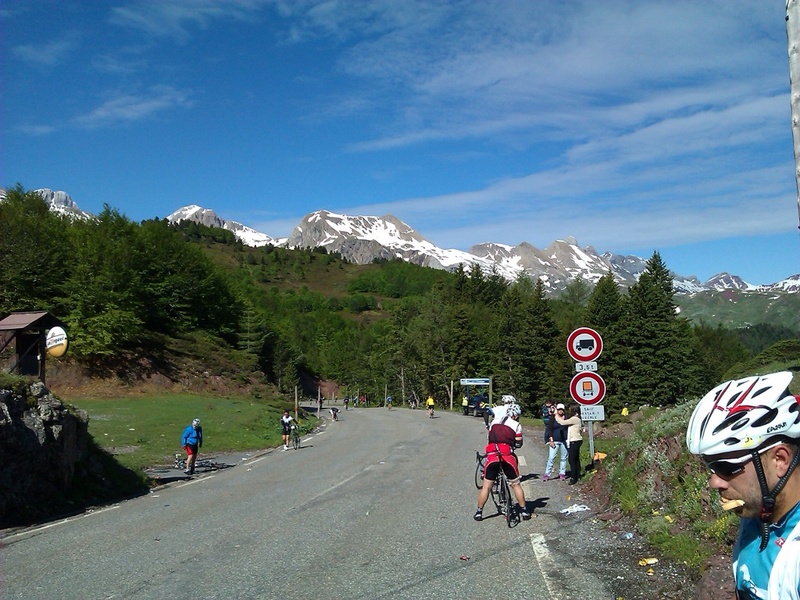 A photo from the top of Marie Blanque(above) and we start going down hill. Grabbing some food and water again and cycling towards Portalet. We go down and cycle through the Osseau Valley. When we already have around 125 kms. we start climbing Portalet. 30 kms uphill to go from Laruns. First kilometers there is a lot of trees and water, you dont really get hit by the Sun in the face, which is something really nice. After passing Artouste damn things started getting harder for me, not as tough as Marie Blanque, but Portalet starts getting long, specially when there are no trees to protect you from the Sun. And after around two hours I reached the top of Portalet and down I go. Below is a picture on top before crossing to the spanish side. The road downhill is good. I stop to grab some food, water and Gatorade. I was careful too going downhill, 80 kms/hr. could be easily reached. When you already have 170 kms on your legs you are faced with Hoz de Jaca. Short, but you are already tired, you want to get back to Sabiñanigo eat something decent and get a shower. So up we go with my 39×29. Once Hoz de Jaca is done its all flat towards Sabiñanigo. Since I was one of the last I had to go alone for around 30 kms. Finish line was not signalled so I had to go through the traffic. A little disappointed with the organization, but loved the race. Waiting for next year to come back. 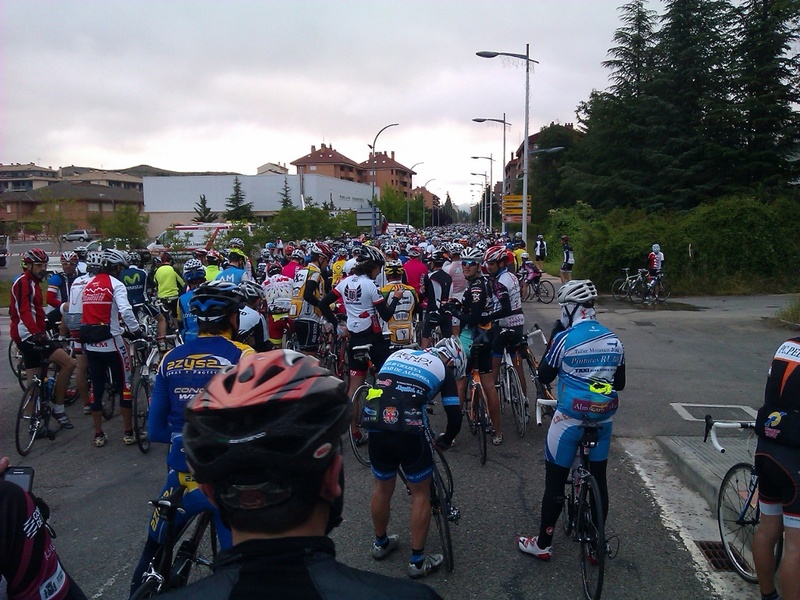 This entry was posted in cycling and tagged Quebrantahuesos on September 5, 2013 by Xavi. My first QH is finished. My time was 10:34. Hell on Earth is Marie Blanque. This entry was posted in cycling and tagged Quebrantahuesos on June 22, 2013 by Xavi. So Im in Sabiñanigo ready for my first Quebrantahuesos. Eight hour trip from Galicia, stop in Torrelavega for lunch. Arrived at 20:20 CEST yesterday. Im really nervous, Ive never made 200 kms. cycling, most Ive made is around 140 kms. Ive also never made so many meters climbing, but Im also really excited and motivated. Cycling with 10000 other ciclist is something you dont do every day. Everyone has a different reason to go, mine is a personal goal, the will to go forward, get something done, finish the race no matter what it takes. Im already aware that weighting 85 kgs. and 1.80 mts Im not in the best shape. Ive done almost 2000 kms since January and went to Marcha Lobeira, Mirador de Ézaro and R&itilde;as do Morrazo among others. Not too demanding marches, but this year in Galicia it rained a lot. Heres a small video that gives a brief idea of what QH is all about. Next post will about my feelings during the march. 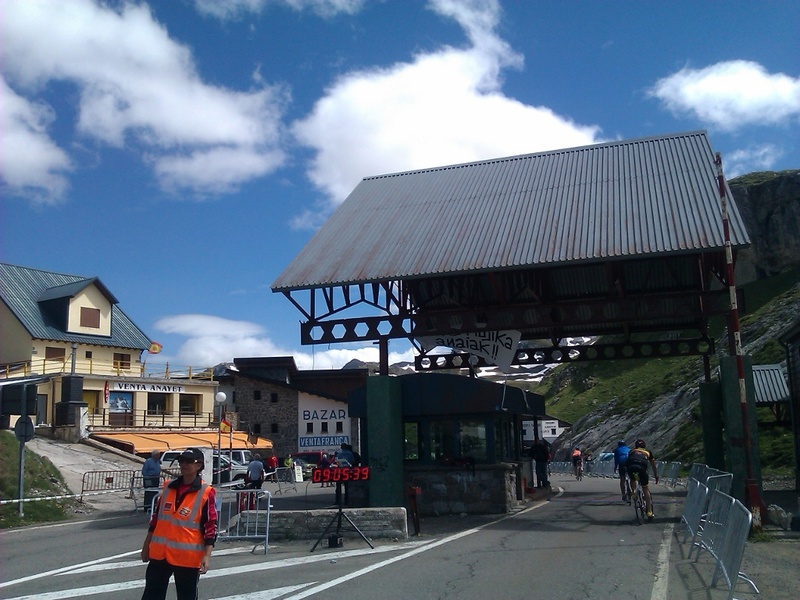 This entry was posted in cycling and tagged Quebrantahuesos on June 21, 2013 by Xavi.